The founding member of Spaceboy, Jim Guerrero, started writing music at an early age. However, it was not till the late 90s that he started producing music for the masses. Inspired by the synth-stylings of The Pet Shop Boys, Erasure, Kraftwerk, Art Of Noise, and 8-bit he has crafted his work into a hybrid of synthpop with modern electronic music of today. With pounding beats, high energy arpeggios and soothing orchestral movements, Spaceboy will sure to be a part of any ones music collection. 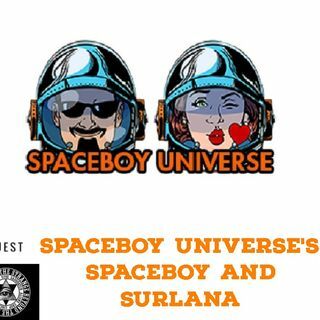 "Surlana" is the pseudonym for co-host of SpaceboyUniverse Live and Spaceboy's wife. Surlana has an extensive experience in research during her time in college as an English major. Surlana researches, contacts guests, pre-interviews guests, maintains social media accounts, maintains the SBU website, and co-hosts Spaceboy Universe. Surlana's artwork on the deviantart site. Currently you can hear Spaceboy’s Fadernaut One open up for Fade to Black with Jimmy Church on the GC Network and syndicated on KGRA Digital Broadcasting Alternative, Paranormal and UFO Radio. In addition, Spaceboy's music has been featured on shows like The Q.Psience Project on the KGRA-DB Radio, Future Theater and Skywatchers on the Dark Matter Radio Network, Truthfunders Radio on Inception Radio, and featured as an 'emerging artist' on Coast to Coast AM for February 2016. Also you can catch Spaceboy as the co-host of the Spaceboy Universe broadcast here on spaceboyuniverse.com website.